TRX is a suspension training system which includes two thick straps with loops for your hands or feet that hangs from the ceiling. It was originally developed for Navy SEALS and allows you to train using your own body weight to fight gravity. TRX is great for developing strength as well as stability, balance, and flexibility, and it is a wonderful way to build amazing core strength. It also allows you to train your body in a more functional way, using many muscle groups simultaneously, rather than isolating one muscle group. This allows you to utilize more muscles and joints working together, just like in real life. 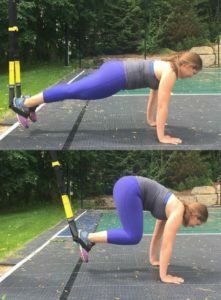 There are tons of ways to use the TRX to train in ways that aren’t possible with traditional exercises. Below is an example of just one exercise. TRX can be used by a person of any fitness level. Just remember that the steeper the angle of the body with the floor, the easier the exercise, and the more parallel the body is with the floor, the more challenging the exercise. Don’t be afraid to try our TRX, which is located in our fitness room. Our fitness staff is always happy to help you with any questions you may have! Place your feet through the handles and lay in plank position. Align your palms so they are underneath the shoulders. Engaging your core, come in to plank position with your feet flexed, heels pushed up against the handles.